I think these muffins taste especially good with fresh blueberries, but my son is partial to them with raspberries. If you use raspberries, increase the sugar by ¼ cup. I bet dried strawberries or cherries would be good, too. Preheat the oven to 400 degrees. Prepare 2 muffin tins by either greasing them or filling them with cupcake liners. Melt the butter and set it aside to cool. In a medium-large bowl, whisk together the flour, cornmeal, sugar, baking powder, salt, and lemon zest. In another bowl or a large measuring cup, whisk together the eggs with the melted butter and the milk. Add the wet ingredients to the dry, stirring until just combined. 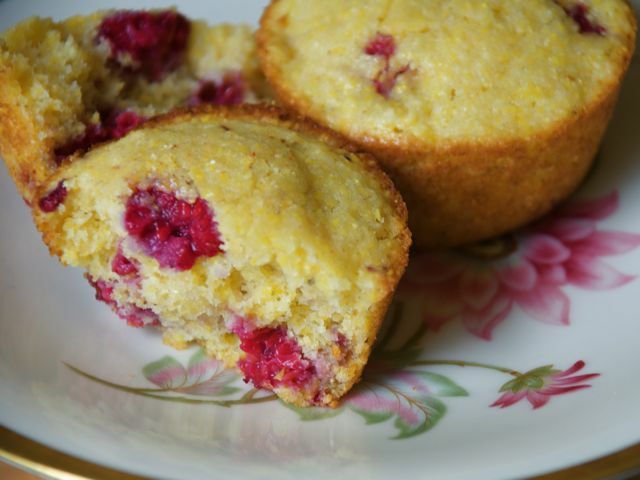 Carefully stir in the berries, then divide the batter evenly between the muffin cups. Bake the muffins in the middle of the oven for 15 minutes, then check to see if a toothpick inserted into the middle of one of the muffins comes out clean. If the muffins are still a little gooey after 15 minutes, bake an additional 2 to 4 minutes. When the muffins are done, remove from the oven and cool for 10 minutes before eating. Culinate editor's notes: If you don't have a fresh lemon on hand, ½ teaspoon freshly grated nutmeg is a nice substitute. You can also substitute ½ cup neutral-flavored vegetable oil, such as canola, for the melted butter. And buttermilk in place of the whole milk adds a bit of tang.